I have included a couple of photographs in this month’s report. 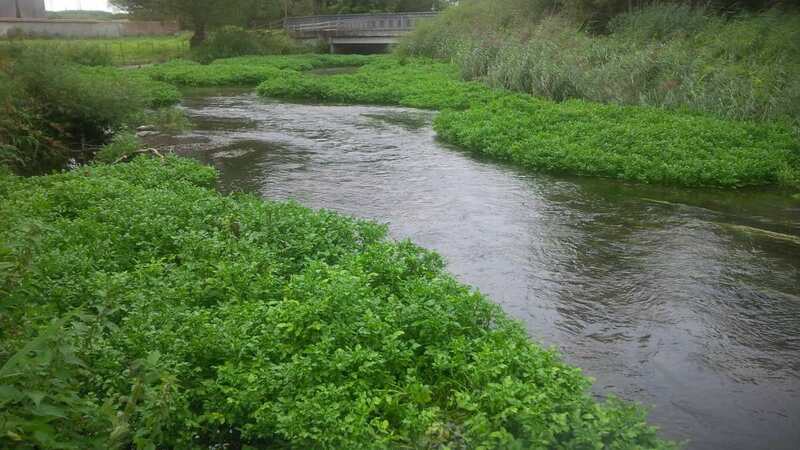 The first is really for those of you who have been too busy with family holidays to get down to the river, and it shows how in these low water years the growth of cress in late summer really does act to hold up levels and indeed to speed up flows – in other words it is an important part of the annual chalk stream cycle and prevents the river degrading into a muddy ditch. Although both trout and grayling are now inevitably concentrated in the deeper parts of the river where they feel safer from predators, they do often move to the shallower, faster flowing stretches in the evening or when they want to feed. This is particularly the case with the smaller, wild trout which will often move from cover to lie on top of ranunculus beds in only a few inches of water – the stretch between Figheldean Mill and the Gated Crossing (Reach 8) is notable for this. That said, the fishing in August has not been easy, and your excellent comments on the catch returns indicate spooky fish, distractions from small grayling and a nice vindication of my remarks about Caenis (plus photo) in the July report – proof that fish on a Caenis hatch will happily take a small beetle/ant/Black Gnat: size seems to be the driver there. But a lovely 3lb brown trout was taken in that difficult bit of water downstream of Sawyer’s bench on what I would rate as the most killing dry fly for this time of year: a small Elk Hair Caddis. So overall I am happy with the August return of 92 takeable browns and, even better, 54 under-sized wild fish. Many of you will have seen that there are two large willows down across the river in that stretch. The upstream tree (just round the corner from the Gated Crossing) has been deliberately left for two years now, and is doing an excellent job improving the in-stream habitat, and acting as a silt trap. It has been a popular place for several members who have found some cooperative fish around that corner. But the big willow that has collapsed across the river further downstream is a different matter, and although it has also attracted several good trout and a shoal of grayling to the changed conditions there, it will have to come out. It is too big a job for our work parties and I will have to rely on Landmarc and/or the Environment Agency to sort that out before we start to get bank erosion in the winter. But for the moment it is not seriously interfering with the fishing, and I hope I have eased the passage along the bank. The other photograph I have included (which the Secretary has also just posted on the July report) is the result of a quick experiment I conducted to see how quickly it is possible to lay hands on a specimen grayling. The answer is quite quickly! 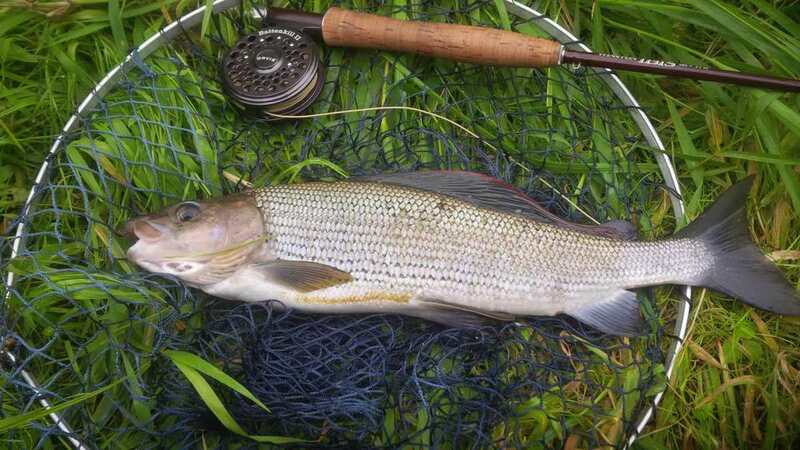 This fish was 18 inches, taken on a Czech nymph, and of course went back, but it is by no means the largest grayling I have seen this season, so I hope it will encourage the autumn grayling fishers among you. As our guests from the Grayling Society made clear last October, we are very fortunate in having a thriving grayling population with a good age structure currently and with some of these seriously big fish among them. This is also a very powerful symptom of a healthy river. Finally I realise that some of you have been irritated by finding dog-walkers, swimmers, Gurkha cress pickers – and also “natural” poaching by otters, of which sightings are now made regularly (but please do continue to report them). I know that the Secretary has put out e-mail advice on trespassers, and on a hot August weekend I am afraid it is a cross we have to bear. But I personally believe that otters do not have a big impact on the brown trout population. In a river, otters find trout are much more difficult to catch than eels and coarse fish, and of course this is yet another reason why ranunculus cover is so important, However this is very different on our stock ponds at Haxton, where the committee has been forced to otter proof our main rearing pond at considerable expense – and take the opportunity to de-silt this at the same time. But this does mean we will be able to continue to stock our own fish, which everyone agrees are of a far higher quality than those we buy in from a commercial farm. Good luck for the last six weeks of the trout season which should produce some great fly hatches. Remember that many of our most experienced members regard this as the most interesting fly fishing of the year.